Trinnov Audio's "ultimate amp" supports Dolby Atmos and Auro 3-D | What Hi-Fi? Trinnov Audio has launched the Altitude32 – "the ultimate AV pre-amp" – capable of decoding Auro 3-D and Dolby Atmos, provided you've got the necessary £26,900. 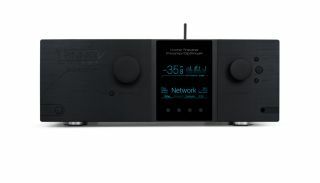 The Altitude32 is clearly geared towards professional environments - or particularly discerning customers - but shows the increasing support for Dolby Atmos across the wider AV industry and, as Trinnov Audio modestly states, paves the way for "a whole new generation of luxury home cinema processors... driven by 3D Audio, 4K and HDMI 2.0." As the name suggests, the Altitude32 has an impressive 32 discrete channels on board (Dolby Atmos can support up to 34) and, provided you pay an extra £1950 for the 3D Audio package (! ), can decode both Atmos and the similar Auro 3-D format. Without the 3D upgrade, it supports the more commonplace Dolby Digital Plus, Dolby TrueHD, DTS Digital Surround and DTS-HD Master Audio codecs. The processor also supports high-res WAV and FLAC files up to 24-bit/192kHz, too. The pre-amp’s processing is driven by a single, multi-core Intel processor, and claims to be future-proof thanks to the ease of releasing software upgrades. The Altitude32 also pioneers the French company's own patented 3D mapping and room optimization technology, which claims to enhance performance according to a specific room’s shape using the company’s £550 3D Measurement Probe (microphone to me and you). It’s not surprising that a product of this spec isn’t shy of connections. Of its "118 digital and analogue inputs", there are eight HDMI, four optical and four coaxial digital inputs, as well as 16 balanced analogue inputs. As for its "80 audio outputs", digital outputs include two HDMIs and one coaxial and optical apiece, while 32 are balanced analogue outputs. There’s built-in wi-fi and a web-interface display. Its aluminum casing comes in a black or light grey finish as standard, with a silver finish available... for a £650 premium. Beneath this top-ranging model are three other versions with 8, 16 or 24 channels and fewer connections, the most stripped down available for £14,950. Other products in the range include the Magnitude32 multi-channel processor and Amethyst hi-fi pre-amplifier. Ready to place your order? Head over to the Trinnov Audio website for more information.